Caramelized White Chocolate Tart — always with butter. In the bowl of a stand mixer, add the butter and powdered sugar. Beat together until creamy. Add in the egg yolk and mix until combined. Then add in flour and salt and beat until fully combined. It should hold together in a ball, if it is a bit crumbly, add cream. Shape into a flat round disk, wrap in plastic wrap and chill for at least 1 hour. Once chilled, unwrap dough onto a floured surface and let soften a bit until pliable. 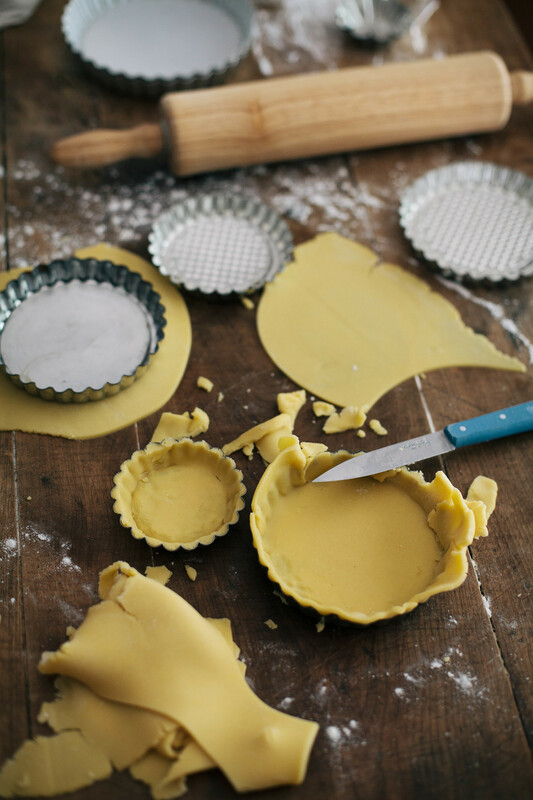 Roll out dough to an 11" disk and either press into your one large tart tin or cut to shape into small ones. Loosely wrap in plastic and chill lined tins for 30 minutes. Line dough with parchment paper. Fill with pie weights, or dried beans or coins. Bake for 30 minutes until the edges just begin to brown. Remove from oven, remove weights and parchment. Let cool completely. Place chocolate in a large bowl and set aside. In a saucepan, bring cream to a simmer. Pour over the chocolate and let sit for 5 minutes. Whisk until combined. Whisk in eggs and salt. Pour into tart shell(s) and bake for 20-25 minutes until firm. Let cool completely. Oven 350 degrees F. Line a baking sheet with a silpat or parchment and set aside. Combine the sugar, brown sugar and salt in a bowl. Set aside. In a large bowl, whisk egg white, vanilla and water until frothy. Add the cashews and gently toss until well coated. Add in the sugar mix and toss until evenly coated. Spread onto the baking sheet and bake for 40-45 minutes. Stirring every 15 minutes. Let cool completely, if in clusters break up. Sprinkle over tart(s).